There are some incredible Spanish tapas restaurants in London at the moment. 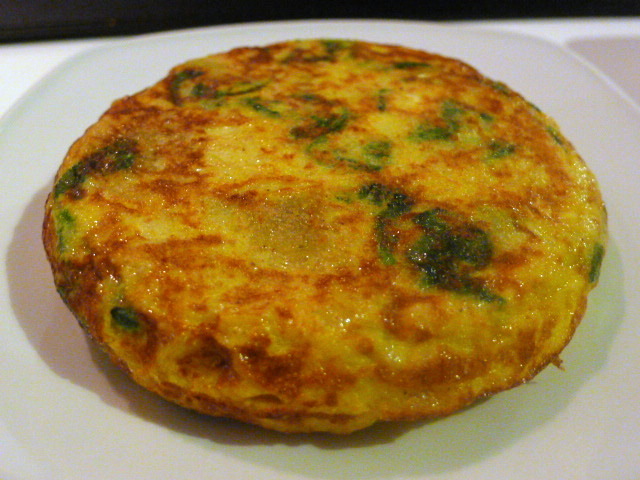 The ones that immediately spring to mind are José, Pizarro and Barrafina all of which are fabulous in their own way. The latest tapas restaurant to burst onto the London scene is Donostia, named after the Basque word for the Spanish foodie mecca that we all know and love as San Sebastian. Head chef is Tomasz Baranski who use to run Barrafina and Fino, both of which are owned by the hugely successful restaurateur brothers Sam and Eddie Hart. Situated on trendy Seymour Place, just down the road from Vinoteca, Donostia has a canteen look to it, albeit a very stylish one. Dark wood floors provide a contrast to the restaurant’s long, sleek and white interior. Donostia rings with a comfortable and contemporary casualness. The menu is designed for sharing of course, and there is a range of pintxos (smaller plates) plus larger ones that cover a range of meat, fish and veg. 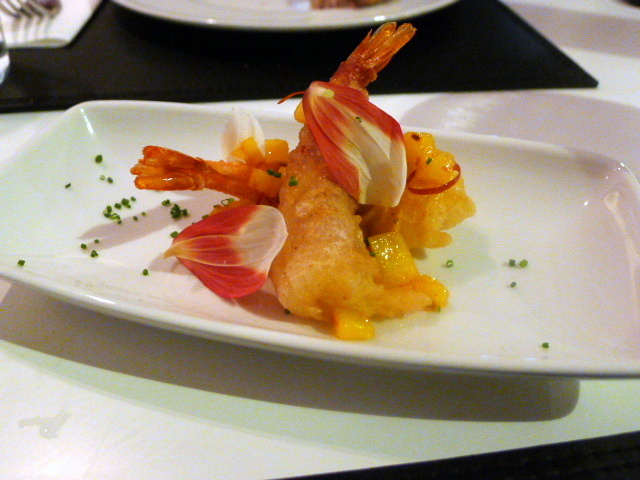 First up were the tempura prawns (£4.20) with Bayonne ham and mango. The prawns were well cooked and firm, but was let down by the fact that it was very, very salty. The batter was neither flaky nor airy in the way that proper tempura batter ought to be, but was quite crispy nevertheless. The ham and the mango was a nice contrast for the prawns. 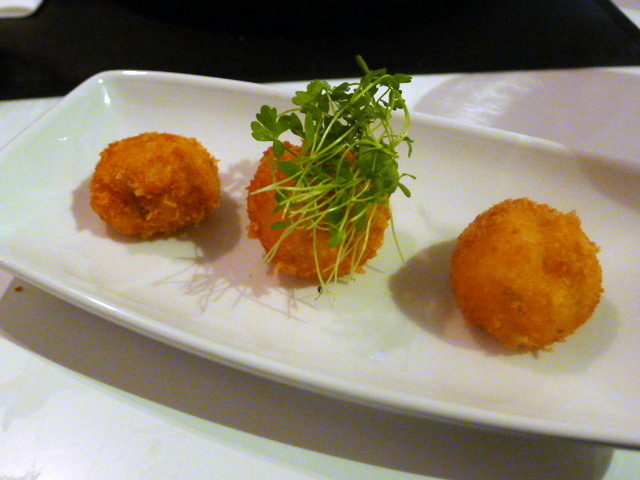 Crispy creamy croquetas with jamon (£3.50) showed huge potential with its airy and creamy mash filling. But again the seasoning of the croquetas was ill judged and quite salty. 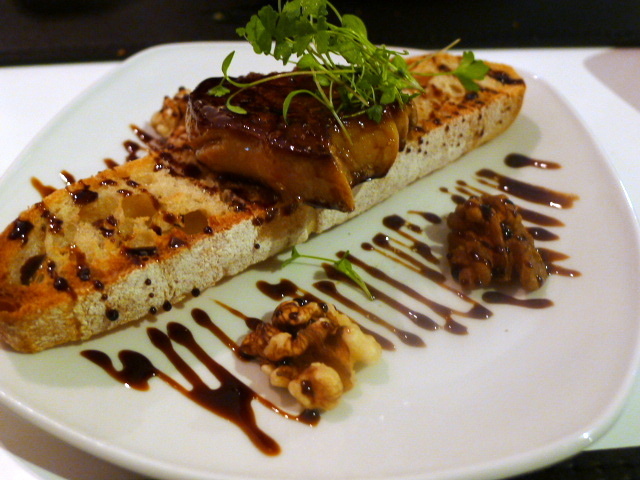 Foie gras with walnuts and PX vinegar was gorgeous and great value at £4.50. The foie gras was beautifully cooked and oozed with deliciousness. The walnuts were an interesting accompaniment, but the PX vinegar, with its precise and intensely reduced flavour, was a skillful pairing for the foie gras. 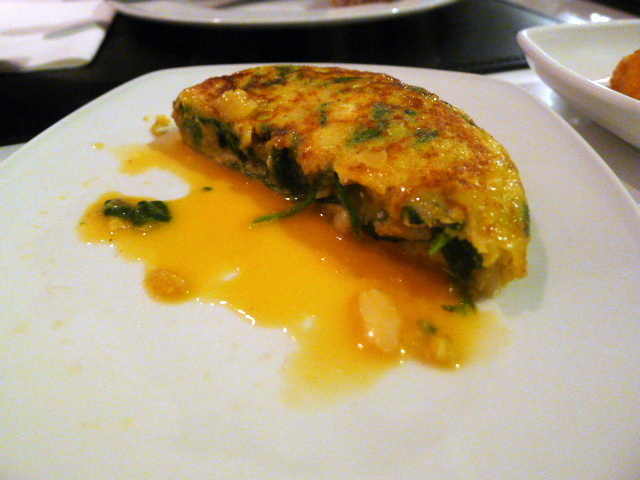 Tortilla bacalao (£6.50) with salt cod, potato and spinach was acceptable but lacklustre. The punchy flavour that one might have expected from the salt cod wasn’t forthcoming, and the overall delivery was of something quite eggy and runny. 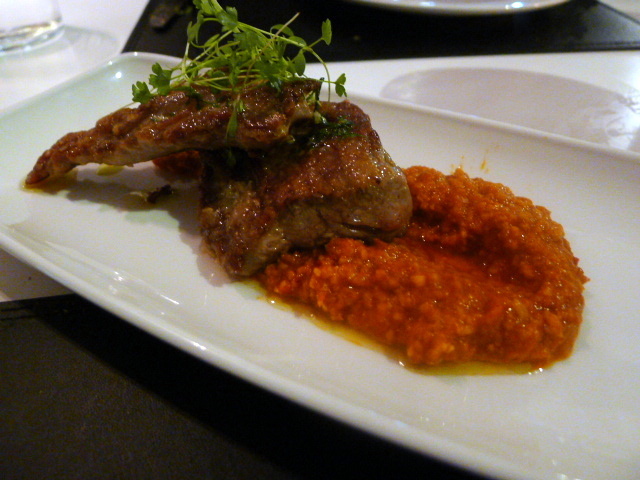 Pork shoulder with Romesco sauce (£12.50) was glorious if a little fatty. Like the foie gras, this was another moment of brilliance. The pork was flavoursome and tender, and the sauce was well executed with its sweet tomato essence being boosted by a hint of chilli. The nuttiness of the sauce really lifted the meat. Being a little overcooked, lamb cutlets (£15.50) turned out to be slightly chewy. 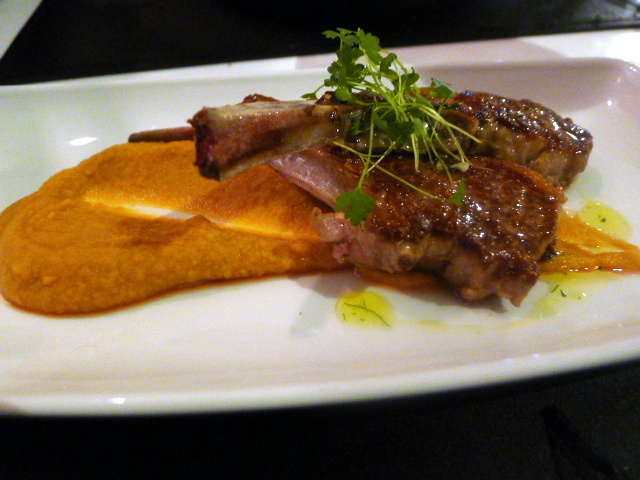 But they were still quite tasty, and a chickpea puree went well with the lamb. However, the portion was small and seemed expensive for the quantity on the plate. 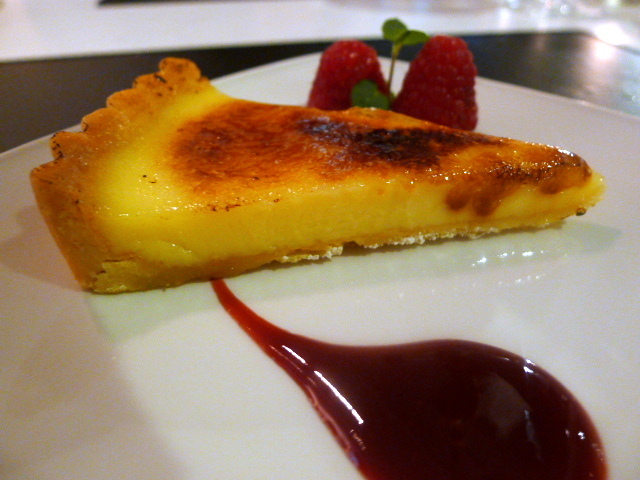 The filling in a lemon tart (£5) with a summer fruit sauce was zingy and good. But the pastry wasn’t short enough and tasted doughy. There was also a touch of bitterness in the caramelised brûlée-style topping. The service was accommodating, but the timings could have been better. We endured a bit of a wait between the tortilla and the pork, suggesting there are some issues in the kitchen that could be ironed out. There were moments of greatness with dishes such as the foie gras and pork proving mesmerising. But the meal was also tempered by bouts of poor judgment such as the occasional instances of over seasoning and uneven cooking. But Donostia has promise, and with a bit of tweaking it has the potential to become one of the better tapas restaurants in London. Price range: About £30 – £40 a head. Excluding drinks and service. Great post. I look forward to trying. BTW, your title says “Donastia”. I think you mean “Donostia”. Thanks folks for letting me know about the typo. Oops. I have now corrected it. Great idea of Spanish Taps Restaurant REVIEW, at Donostia. I simply want to mention I’m new to blogs and truly enjoyed your web page with yummy food image design.